Your password should be at least 8 characters long and include letters and numbers. What are equity mutual funds? Mutual funds gather money from a lot of investors and create a corpus which gets invested in different companies and profitable opportunities. Equity mutual funds are those mutual funds that invest most of their corpus in the equity shares of companies. The equity scheme invests according to its investment mandate - meaning that "Large Cap" schemes will not invest in Small Cap companies, "thematic" equity schemes will invest in equities around a certain theme, etc. Equity funds can be growth or value-based, and this basis decides the way the stocks are picked. After allocating the majority of the corpus proportionally between companies as per the investment mandate, equity mutual fund schemes allocate the remaining bit if the corpus towards debt securities and money market instruments in order to keep the fund liquid enough to meet withdrawal requests of investors. Equity mutual funds are considered to be riskier than other types of mutual funds because the majority of the corpus is invested in equities that could rise or fall with little to no prior warning. While the risk is certainly higher, so is the potential reward (profits). A well-researched and well-managed equity scheme is the ideal investment - as it implies that calculated risks are being undertaken by those that understand the working of the market. How does an equity mutual fund work? Like all mutual fund schemes, equity mutual funds also pool resources for investment. These funds invest in the stocks and shares of companies that are predicted to perform well based on detailed market research and analysis. What are the types of equity mutual funds? These mutual fund schemes invest in companies whose market capitalization is less than $2 billion. These stocks are considered to be riskier than mid or Large Cap stocks. These mutual fund schemes invest in companies whose market capitalization is between $2 billion and $10 billion. These stocks are considered to carry less risk than Small Cap stocks, but are riskier than Large Cap stocks. These mutual fund schemes invest in companies whose market capitalization is over $10 billion. These stocks are considered to be the least risky investment as far as equity stock picking goes. These funds pick the stocks of companies that function in a particular sector - like pharmaceuticals or banking. These funds pick stocks of companies around a particular theme like infrastructure or travel. Also called value investing, these equity mutual fund schemes pick stocks of companies that are undervalued and expected to make a meteoric rise in the near/distant future (time-frame being dependent on the fund’s time frame). The stocks chosen are purchased at a very low valuation, enabling a lot more to be bought, and when the value spikes - are sold off or held depending on the investment mandate. These are the most common equity mutual funds which invest in companies that are already performing well and are slated to grow and perform better in the future. The stocks and shares of these are usually at or higher than the current market valuation, and spikes in performance do provide returns, but not at the level of equity value funds. Fund managers pick the sector according to the fund mandate, and then pick companies performing well in that sector in which to invest. Fund managers spend time researching various companies based on their profitability and potential for growth irrespective of which economic sector or theme they belong to. 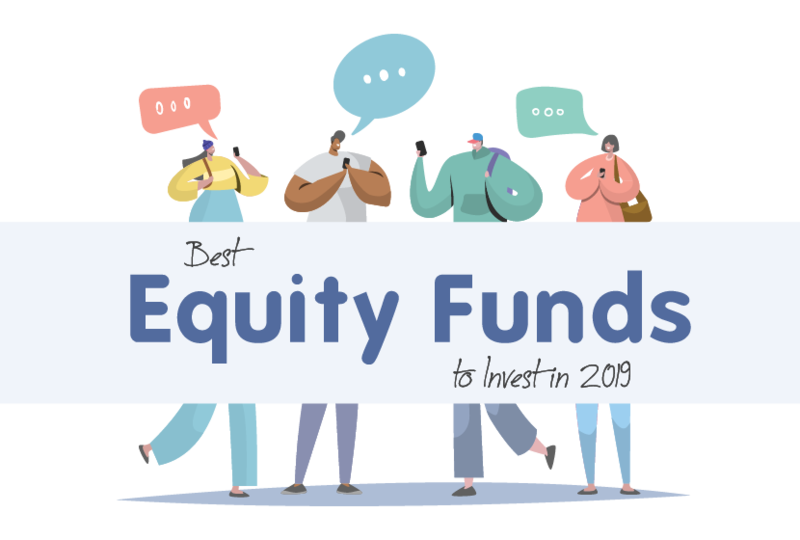 Equity funds invest up to 99% of their corpus in equities, but can also drop this allocation down to anything above 65% (while still being counted as an equity scheme). The remaining corpus is allocated toward different securities like debt or money market instruments. Also, as far as Indian income tax laws are concerned, an equity fund invests at least 65% of its corpus in equity shares of domestic companies. This means that, for income tax purposes, funds that invest in equities of international companies are considered debt funds. Equity Linked Savings Schemes - or ELSS as they’re more popularly known - are equity mutual fund schemes which have been recognized by the Income Tax Department of India as tax-saving investment avenues. Under Section 80C of the Income Tax Act, 1961, up to Rs.1,50,000 can be exempted from taxation annually through investing in ELSS Funds. Who should invest in equity mutual funds? The primary category of investors in equity funds are those that are able to handle a fair amount of risk for the potential for a huge reward. Risk-averse investors and investors who are not looking for capital appreciation do not usually opt for these funds, as they invest in debt mutual funds instead - which are safer but historically have provided far lower returns. Anyone seeking to increase the value of their idle money can invest in equity funds. Minimal research is required before making the investment, as most equity funds are managed by professional fund managers and market experts. The investment can simply be handed over to the AMC and the fund’s performance depends on the stocks chosen - by the fund manager. Investing in equity mutual funds has proven to be so beneficial in creating wealth, in fact, that its popularity is rising at an exponential rate. With the advent of mobile technology and the internet, mutual fund investing has never been easier. It’s a 10-minute process to get started investing in mutual funds. Step 4: Discuss your investment history, risk-taking ability, investable amount, etc. with a team of award-winning market analysts and investment experts. Step 5: Invest and watch your money grow on the FundsIndia investment dashboard - either online or on your smartphone through the FundsIndia app. You can track and manage your investments in the highly intuitive app-based interface. Buy, sell, trade at the touch of a button. Paying the entire investment amount up-front at one time - this is called the lump sum approach. Investing small amounts of money at regular intervals for a predetermined tenure - this is called the SIP or Systematic Investment Plan approach. Both these methods of investing have their benefits and drawbacks and can be further pursued here. Why invest in equity mutual funds? Among all other investments, equity fund schemes have historically been able to provide market-beating and inflation-beating returns. Most safe investments like fixed deposits, recurring deposits, etc. offer a rate of interest that provides little to no increase in money value after accounting for inflation. Investing in an equity mutual fund scheme means that the investor will hold a huge number of stocks and shares of various companies across different business processes, themes, sectors, etc. Holding a wide variety of stocks in one’s portfolio ensures that no great losses occur which cannot be offset by gains in another part of the portfolio. As one of the only few financial products that can provide real market and inflation-beating returns, equity mutual fund schemes are the only real option for those who wish to invest and grow their capital over the medium to long term. The Equity Linked Savings Schemes, or ELSS as they’re commonly known, allow for up to Rs.1,50,000 to be spared from annual taxable income every year if invested in this avenue. ELSS is also the only tax saving investments under Section 80C that has provided such high historical returns - no other Section 80C has been able to match the returns generated by equity mutual funds. Most equity mutual fund schemes are managed by professional fund managers with advice from market analysts. This live tracking on investment securities and investment opportunities allows for risk mitigation and clarifies the choice of which stocks to invest in. Stocks and shares are traded across all major worldwide exchanges on a daily basis. While not immediately as liquid as withdrawing funds from a savings bank account, the liquidity offered is far higher than most other mutual fund schemes or investment plans. How to calculate the value of an equity mutual fund? One can invest in equity mutual funds through lump sum method or through SIP investments, both of which have their own benefits and drawbacks. To learn the potential value of your investment into a mutual fund scheme on its maturity date, use our state-of-the-art SIP investment calculator. The value of a mutual fund scheme is determined in large part through its Net Asset Value or NAV. The NAV of mutual fund schemes rises and falls based on the performance of its invested assets. FundsIndia is India’s friendliest online-only investment platform. Built on robust technology, FundsIndia gives users access to mutual funds from leading fund houses in India, stocks from the BSE, corporate fixed deposits and various other investment products, all in one convenient online location. In short, FundsIndia is your one stop shop to build wealth.